Today’s traveler doesn’t have to fly or drive blindly into the path of a severe hurricane during a trip to Mexico. Although Mexican insurance for cars by Mexican Insurance Store travel won’t protect you from hurricanes, the tourist support services may provide information in an emergency situation. Additionally, your Mexican car insurance policy includes travel interruption coverage that may be helpful if you are affected by a severe weather event. Meanwhile, use the following tips and onformation to minimize your risk of being affected by major incidents such as fall hurricanes. Thanks to wireless technology, you don’t need to speak Spanish proficiently to understand and review weather forecasts for your destination. 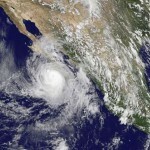 Because both Pacific and Atlantic hurricanes can affect Mexico, it is important to monitor for these situations during the summer and fall months. Fortunately, most hurricanes have time to develop over a few days’ time as they begin at the tropical storm level. Projections can provide further information about the expected direction a system will travel. Plan accordingly, adjusting your destination or timing as needed to avoid being in the general vicinity of any potential landfall zones. Consider heading further inland if you anticipate a coastal touchdown of a hurricane or tropical storm. Think about cutting your trip short and heading home before such an event can cause you to be stranded. Travel with extra supplies just in case an area is cut off from through traffic. If you do need to adjust your trip’s timing, Mexican insurance for cars by Mexican Insurance Store might allow you to obtain a partial refund based on how much of your policy period has already lapsed. If you decide to cancel altogether, you can obtain a full refund on a Mexican car insurance policy as long as you do so before the start date. You need to keep in mind that a detour could affect your liability needs, making it important to double check and review coverage requirements of your Mexican insurance for cars by Mexican Insurance Store before crossing into other Mexican states. If you will travel through more than one state, you should opt for a high-limit Mexican car insurance policy from the outset to ensure that you will be financially covered in any serious accidents. Planning for a trip in Mexico? You may get hit by a hurricane if you do, but then your Mexico auto insurance and travelers insurance are useful in times of natural calamities. Pack your lightweight raincoat which is small enough to store in your back pack. It’s handy when rain is pouring. Always have your Mexico insurance because you need it most during hurricane season. When there’s hurricane in Mexico, it does not mean not travelling to hurricane-prone areas anymore. All you need is the right information about the weather and also your Mexican auto insurance. Despite some rains, you can still get a nice travel experience. If you can’t avoid traveling while there is hurricane, just don’t forget your Mexican auto insurance. You need it most during long and risky travels. A big part of a trip to a place like Mexico is the chance to join locals to have fun in a particular festival or event. Make sure you’re driving with Mexico insurance to avoid stress and troubles.